New name, logo for pro soccer: "Minnesota United FC"
Minnesota's pro soccer team will again have a new look in 2013, as the team - known previously as the Minnesota Thunder, the NSC Minnesota Stars, and the Minnesota Stars FC - is re-branding itself as Minnesota United FC. The name, logo, and jersey change will allow new owner Bill McGuire to stamp a new identity on his team, thus completing an offseason that has seen great changes for the formerly league-owned club. The club unveiled the team's new logo and jerseys at a press conference at Midtown Global Market this morning, in front of a crowd that included both Minneapolis mayor R.T. Rybak and St. Paul mayor Chris Coleman, both of whom spoke at the unveiling along with North American Soccer League commissioner Bill Peterson. Rybak, who was part of the presentation ceremonies at the beginning of the 2012 season, vowed to reprise last year's dive into the crowd at this year's season opener. Fans will want to be on the lookout for flying mayors. The new logo, as you can see, includes a loon taking flight over, with a single star representing the club's league championship in 2011. In terms of symbolism, it's been suggested that the sky blue portion of the crest is representative of the Mississippi River in between Minneapolis and St. Paul - the two towns that are "united" in the name. Also, note that the loon has eleven feathers, the number of players on a soccer team (assuming that forward Pablo Campos has not headbutted anyone and been sent off). There had been some question of whether the team would keep its "Stars" moniker as an informal nickname for the club, but once the logo had been unveiled, there was no question that "Loons" would be the correct appellation. The press conference had hardly ended before the Dark Clouds were on stage, singing songs involving the word "Loons." I talked to several fans, some of whom had their doubts prior to the announcement, but they all reacted positively to the change - a good sign for the team. Unfortunately, these jerseys will not be ready to go for the season opener, given that kickoff is just a month away. According to team jersey impresario Kevin Friedland, the team is likely to wear a simplified version for the spring season, and introduce the full version for the fall season. In the spring, the team will wear plain black and plain white, possibly with sky-blue socks, and the team crest (sans the wordmark you see in the above logo) in the same area. Regarding the team name, club president Nick Rogers said that while there was some discussion about other versions of the name, Minnesota United FC was the clear winner in his mind. And while some have criticized the name as being generic, he believes that's both fair - but also somewhat irrelevant. "You'd talk to people about the Stars, and they'd say, 'Sure, that's the hockey team, they left a long time ago,'" said Rogers. "I think the name had a lot of connection to hockey. So I think it's a fair criticism to say it's kind of generic, but it's also fair to say that 'Stars' was itself kind of generic. United is a name that unequivocally says soccer. And there's only one other pro soccer team in the country with United in their name [DC United]. So we felt good about it." "One of the things that made us feel comfortable about changing the name of the team was the name of the Dark Clouds, which really only made sense was the team was called the Thunder. We figured out that people here just love soccer. " Rogers also says he's not worried about trying to publicize the name, the fourth for pro soccer in the state in five years. "The research we've seen is that most people aren't aware the Stars exist at all. The people that do know it's there are going to be paying attention to us anyway, and the people that don't know we're here are going to be hearing about it for the first time, so I'm not too concerned about it." 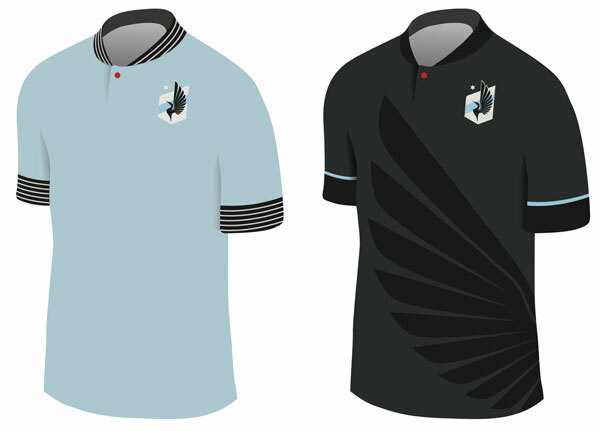 Everything's new for United this year - or for the Loons, or for MinU, as @collinsolberg suggested on Twitter. Now all that's left is to get the team on the field.